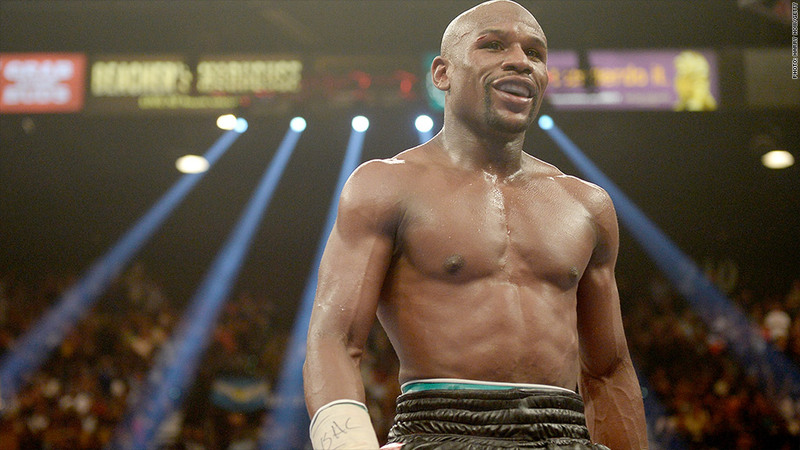 Floyd Mayweather Jr., the nation's top paid athlete, at his most recent fight in May. Floyd Mayweather, the nation's best-paid athlete, has yet to pay a price for repeated charges of domestic abuse. The undefeated welterweight boxing champ will earn $40.9 million in his rematch with Marcos Maidana this Saturday. His first match with Maidana in May netted him $31.4 million. He has two more matches under his $250 million, six-match contract with Showtime, a unit of CBS (CBS). Some estimates put his career earnings at about $400 million. But despite this week's attention on athletes and domestic violence, few expect there to be any drop off in the roughly 1 million homes paying between $65 to $75 to watch Mayweather's fight on pay-per-view this weekend. NFL running back Ray Rice was cut by his team and suspended indefinitely after a video surfaced showing him knocking out his then-fiancee. That cost him at least $10 million in salary and perhaps the rest of his career. The NFL also stopped selling his jersey and EA Sports (EA) was quick to delete his likeness from its Madden football video game. Mayweather is one of the few -- other than Rice's victim, who is now his wife -- to defend Rice publicly. He said at a news conference that he thought it was wrong for the NFL to raise the punishment from its original two-game suspension to an indefinite ban. "There's a lot worse things that go on in other people's households that's just not caught on video," he said when it was suggested to him that the video of Rice was disturbing to watch. Mayweather's own domestic violence record is disturbing. He served nearly three months in jail two years ago for attacking the mother of his children in front of his then 8- and 10-year old sons. The sentence was delayed so he could appear in one of his big payday bouts. Published reports said he also got a suspended sentence and two days of house arrest under a 2002 plea bargain for domestic violence, and another suspended sentence following a 2004 conviction on two misdemeanor battery counts after two woman said he hit them at a Las Vegas casino. Just last week, former fiancee Shantel Jackson filed a civil lawsuit against him alleging that he beat and threatened her over the course of two years. "Floyd Mayweather Jr. may make his living inflicting pain on others in the boxing ring, but he has no right to force Shantel to endure the pain that he inflicted on her outside of the boxing ring," said her attorney, Gloria Allred. But all those charges of domestic violence haven't generated even a fraction of the outrage and attention as the Rice case, maybe because there is no video of him hitting any of the women in the various cases. His sport also doesn't have a central authority with the power to discipline him the way NFL Commissioner Roger Goodell has power over Rice's career. Mayweather tried to dismiss those domestic violence reports at a press conference this week, suggesting that there was no evidence of abuse despite his guilty pleas and conviction. "In my own situation, no bumps, no bruises, no nothing," he said. "You guys have yet to see any pictures of a battered woman." Mayweather's attorneys did not return calls seeking comment on his domestic violence record. A Showtime spokesman had no comment on his record or what it might mean to the number of fans signing up to watch his fights.